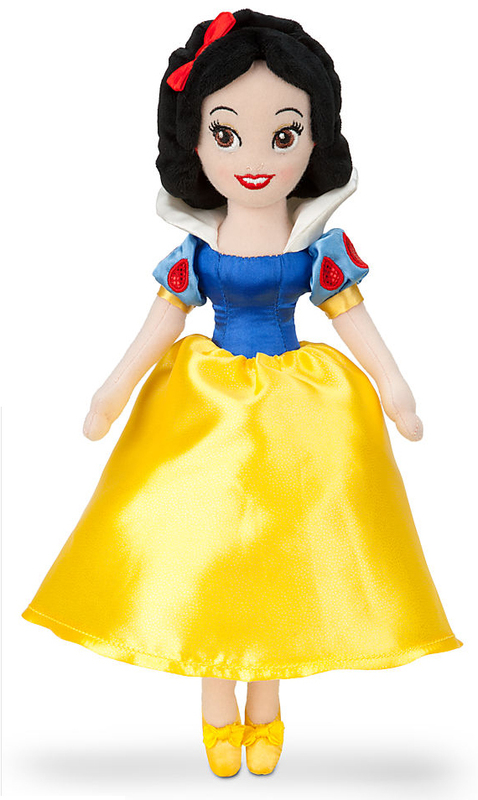 Little Snow White measures 12" tall and is part of the Disney Mini Bean Bag Collection of plush princess dolls. Unlike the earlier 2012 mini plush, this version is filled with plastic pellets. 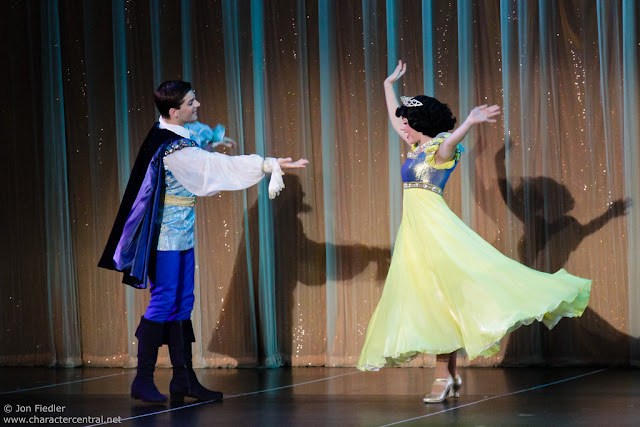 She also wears a solid blue satin bodice rather than one with gold line patterns. And her red hair bow rests to one side, not centered on top. Retail $9.50. Available now. Also see the 21" plush Snows from 2010-11 and 2012-13. "Pillars" is a brand of rather unique looking sculptures sold by Enesco, all created by their in-house designer, Kim Lawrence. 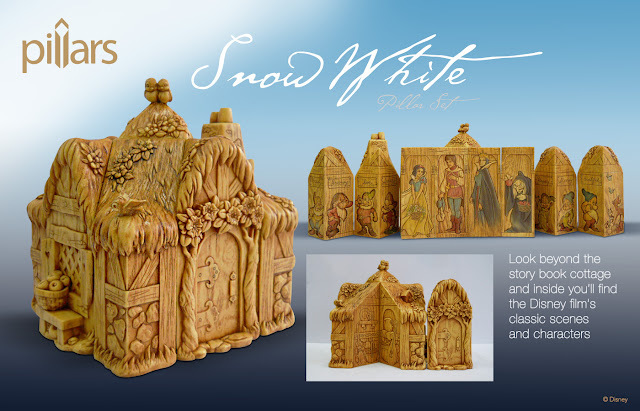 They currently offer several products within this line including the Snow White Pillars Set. Introduced to retailers in October 2012, it will be made available to the public in March. 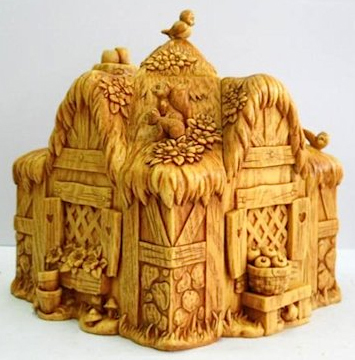 Nine pieces in all, when placed together, they form the Dwarfs' cottage (which measures 7" high with cross dimensions of 7" x 6.5"). 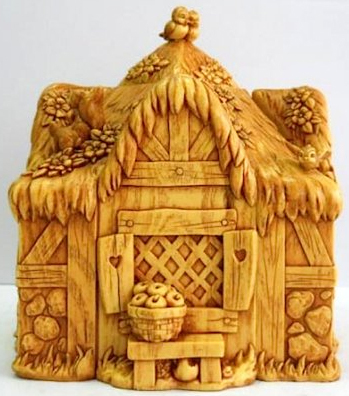 Peel the pillars back and on the inside of the four cottage pieces we find images of the Seven Dwarfs. Four additional pieces feature Snow White, the Prince, the Evil Queen, and the Witch. 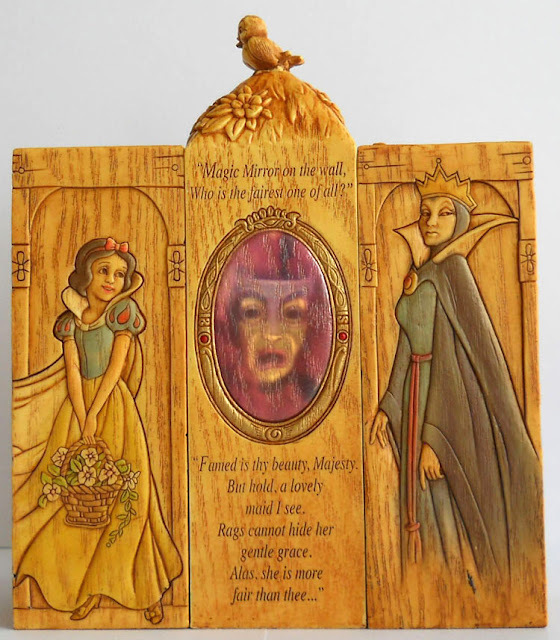 There's also a center pillar which is inscribed with the story of the fairytale and includes an image of the Magic Mirror. Made of stone resin, the suggested retail price for the set is $250. Stock images copyright Disney/Enesco. .
Special thanks to Snow White collector Elana Sperber for the advanced notice on this item. See even more pics at dj1828's flickr album. 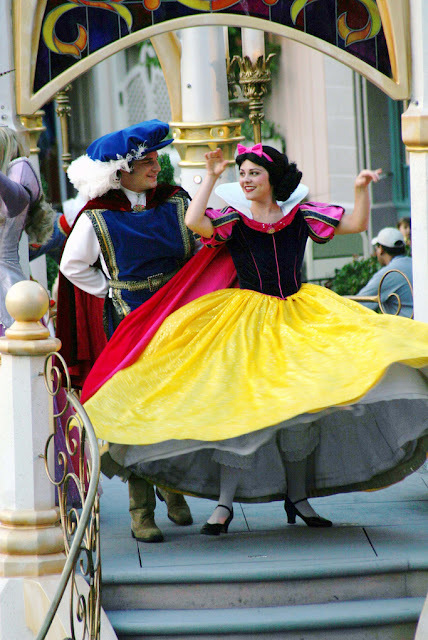 Parade of Dreams, Disneyland, 2006. Photo courtesy of The Disney Camera Guy. Once Upon A Dream Parade, Disneyland Paris, 2008. Photo courtesy of Rene Smit. 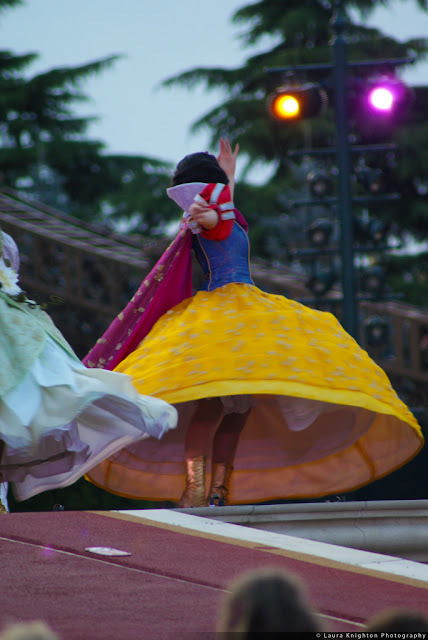 One Man's Dream II - The Magic Lives On, Tokyo Disneyland, 2010. Photo courtesy of Jon Fiedler at PerterPanFan. 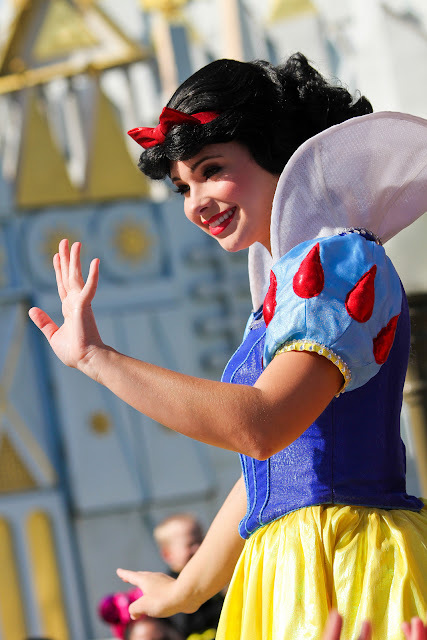 A Christmas Fantasy Parade, Disneyland, 2010. Carlos at armadillo444. Creative Commons. 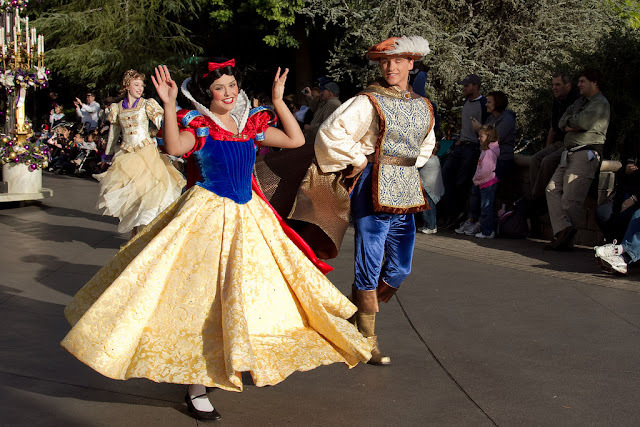 A Christmas Fantasy Parade, Disneyland, 2011. Image via canhasal. Creative Commons. 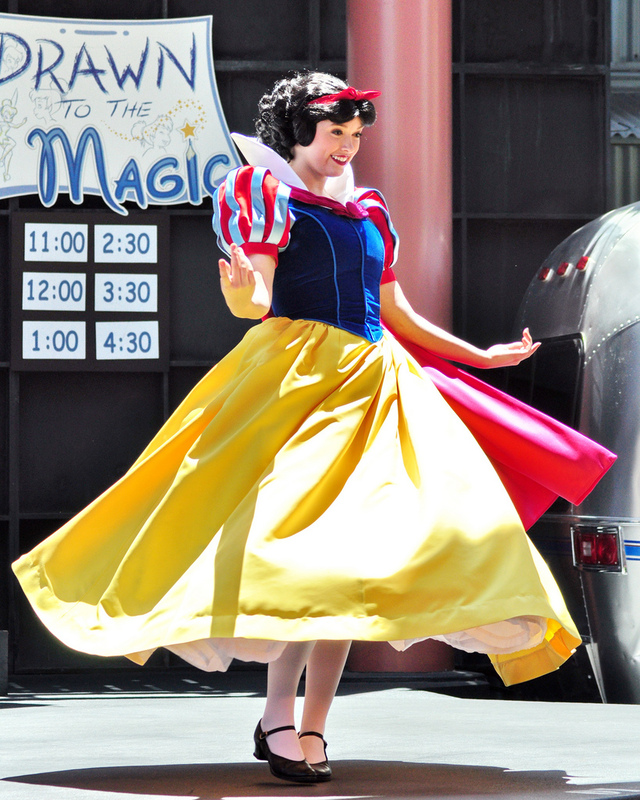 Drawn to the Magic, Disney California Adventure, Disneyland Resort, 2010. Photo via Loren Javier. Creative Commons. 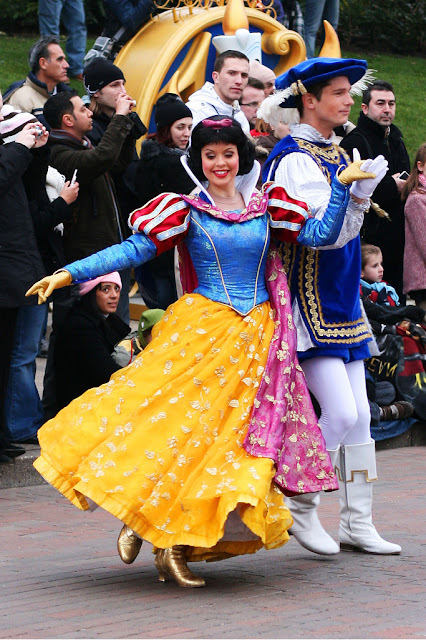 Mickey's Magical Celebration, Disneyland Paris, 2011. 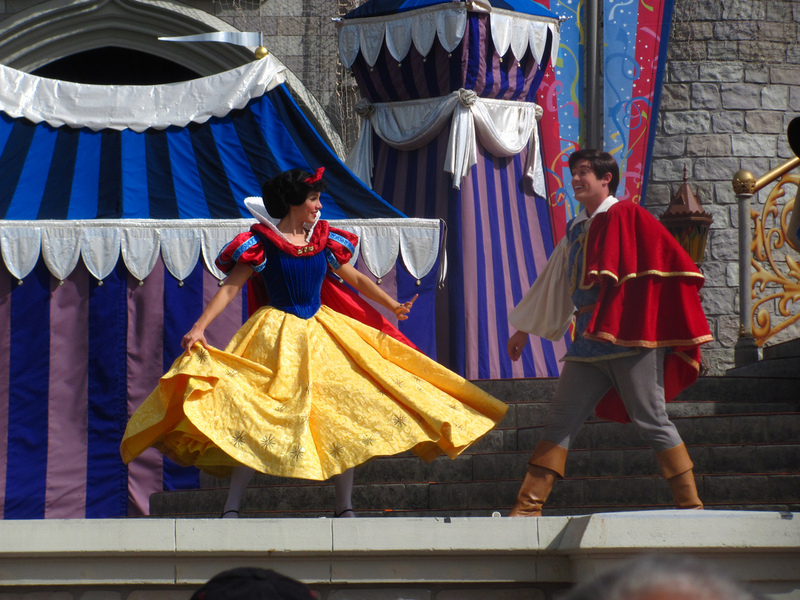 Photo courtesy of ThatDisneyLover/Laura Knighton. Mickey's Soundsational Parade, Disneyland, 2012. Photo courtesy of Jeremy Wong at heytherejere. Photo courtesy of Rebecca Van Loon at snow1937white. 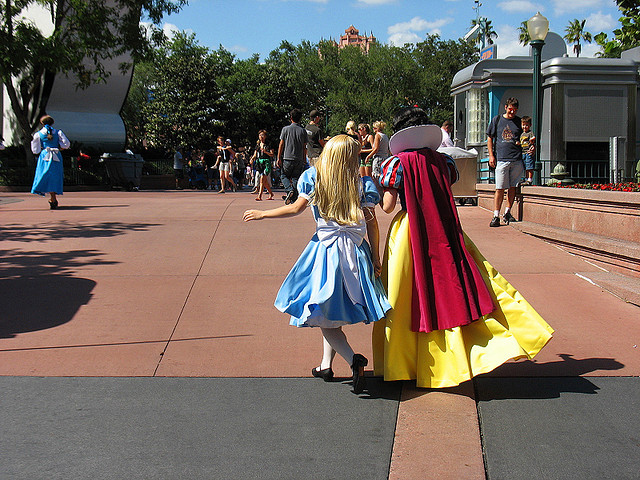 Alice and Snow out and about in then Disney-MGM Studios, Walt Disney World, 2007. All images used with direct permission from the respective photographers or under Creative Commons licensing. 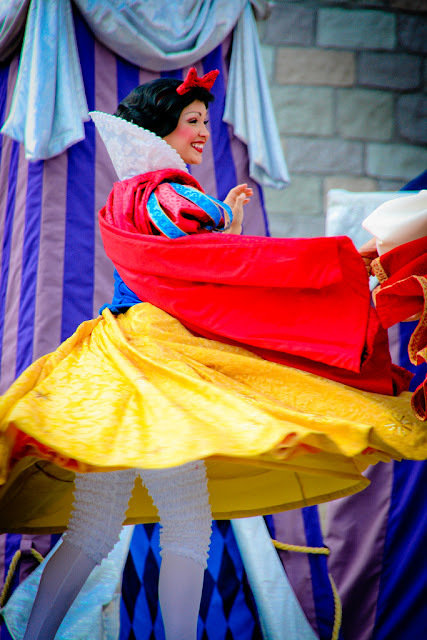 Inspiration for this archive post came from the Disney Ladies in Motion flickr group. 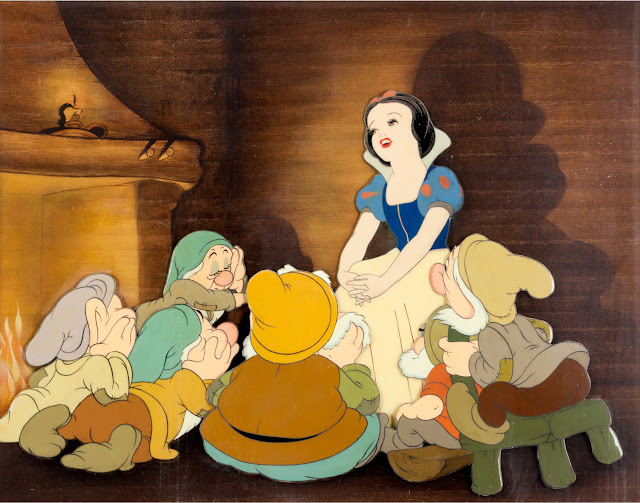 Disney historian and best-selling author Jim Korkis is back at it with more great little-known anecdotes and unofficial stories from Disney's past. His authoritative but friendly and accessible style make for enjoyable reading. Over the past couple months, Jim has released several Snow White-related articles including one on the evolution of the Disney princess, published December 21, 2012 (the 75th anniversary) in the UK-based tabloid The Sun. 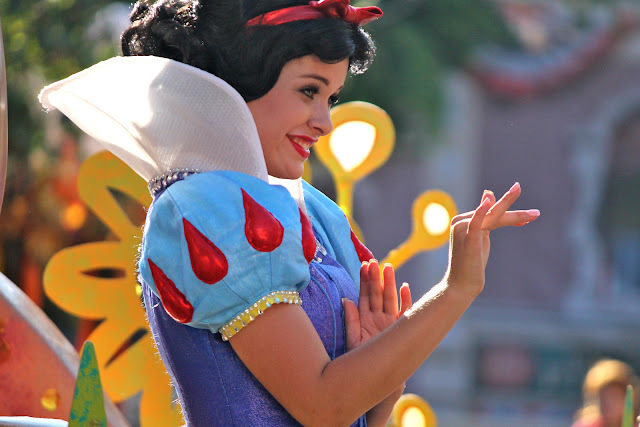 Read Fairest to Feminist. The piece was greatly expanded and posted on MousePlanet earlier this month. 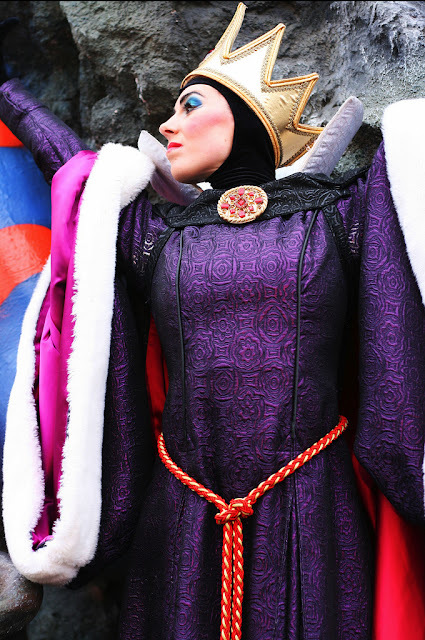 Read Evolution of the Disney Princess. Then just a few days ago, MousePlanet uploaded Debunking Disney Stories, a piece in which Jim does just that. It includes an interesting segment on the Disneyland statues from Snow White's Grotto. 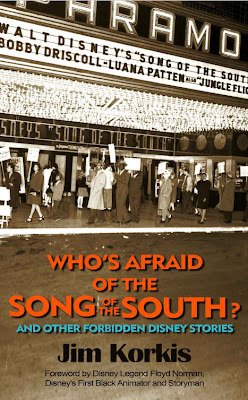 The big news is the release of Jim's new book, Who’s Afraid of the Song of the South? 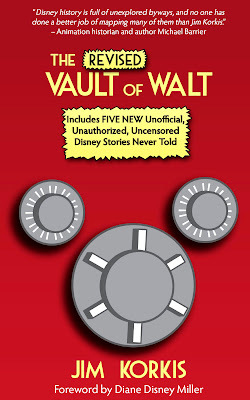 It's the first definitive account of the Disney film, its history, its production, and the controversy that still surrounds it today. 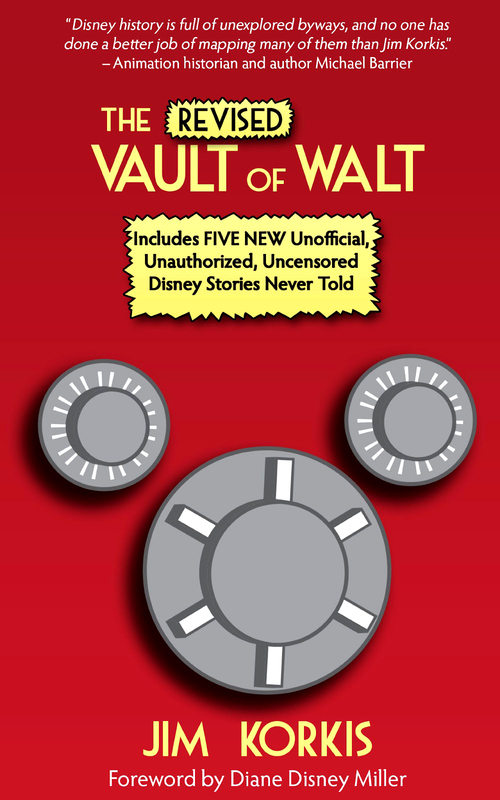 In addition, his 2010 title The Vault of Walt has now been completely revised with a major overhaul and five brand-new stories. 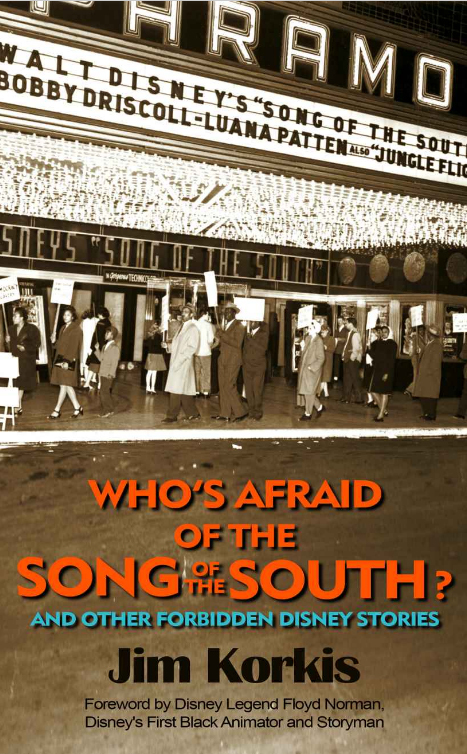 Who’s Afraid of the Song of the South? 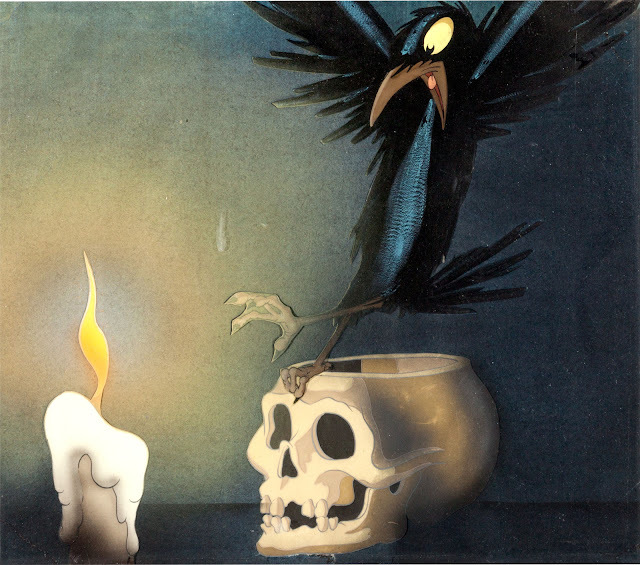 Snow White Crow and Skull Courvoisier Production Cel, 1937. 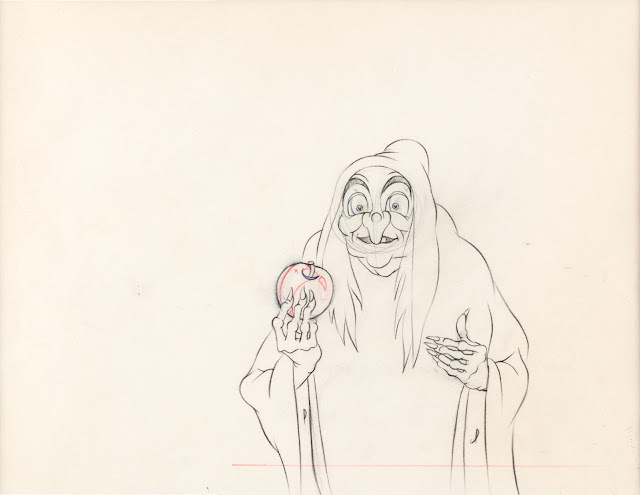 Scene of the Queen's pet crow, reacting in horror to the Old Hag with her poisoned apple. Image area measures approximately 10.25" x 9", overall size 18" x 17.25". 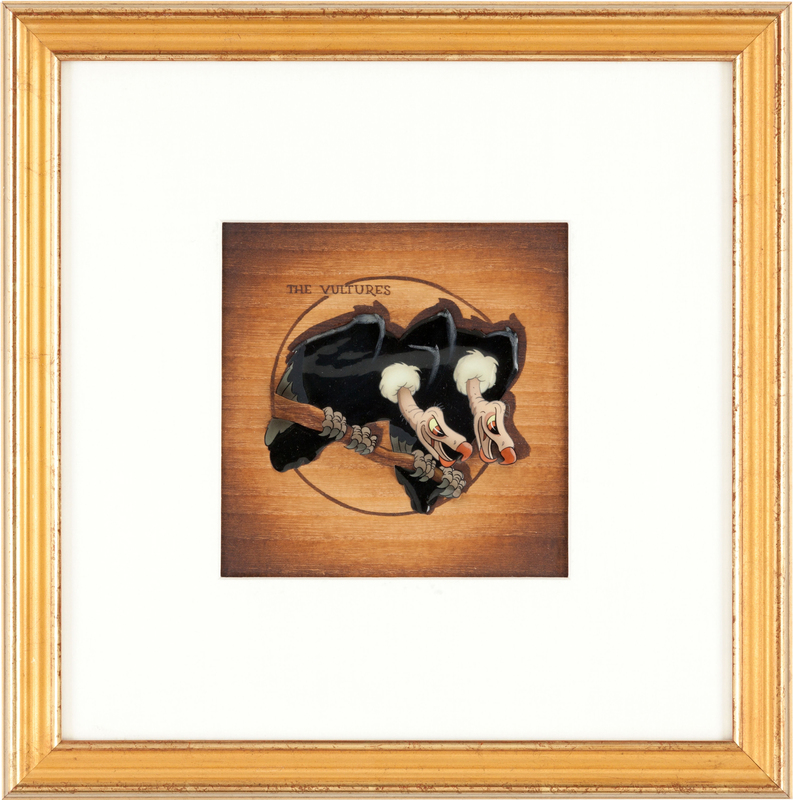 Vultures Production Cel and Courvoisier Background, 1938. 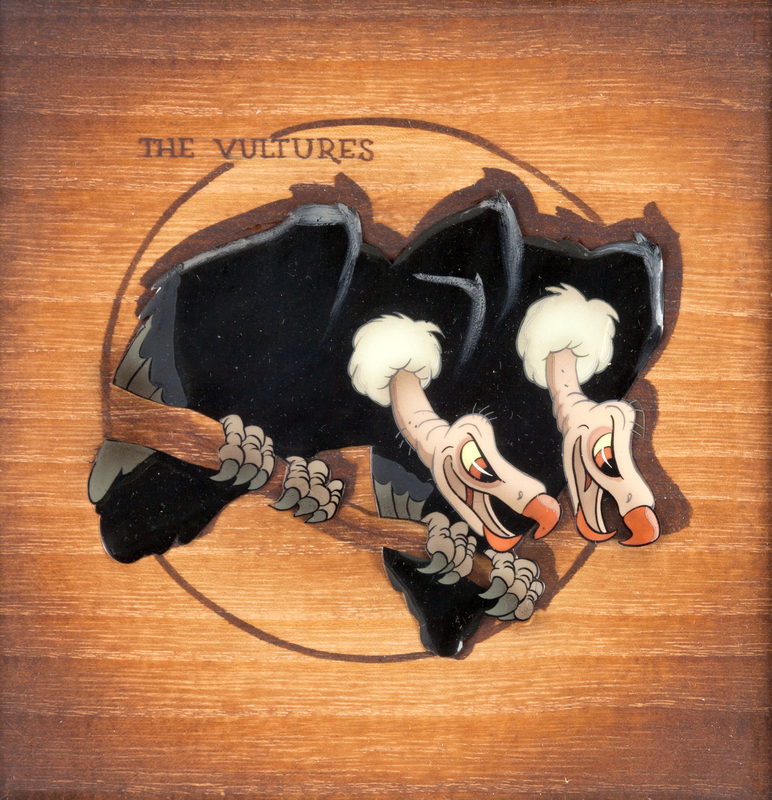 Cel art featuring the vultures is among the toughest to find since they appear only briefly in the film. Courvoisier woodgrain background. The birds are approximately 3" x 4" within an image area of 6" x 6"; Frame 13.25" x 13.25". 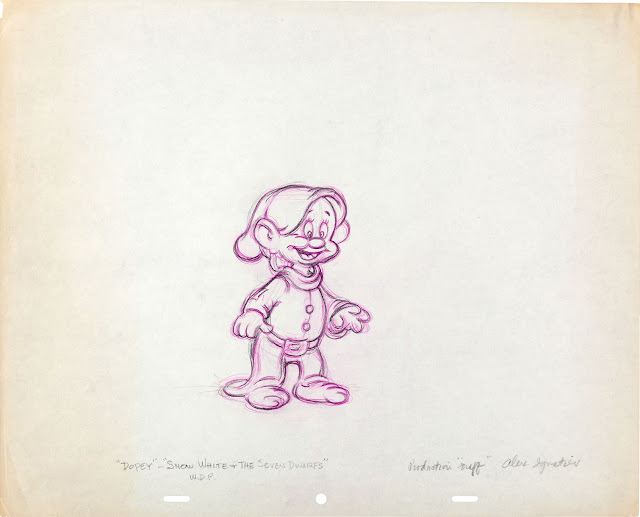 Images and info from Heritage Auctions via the Animation Art Signature Auction. 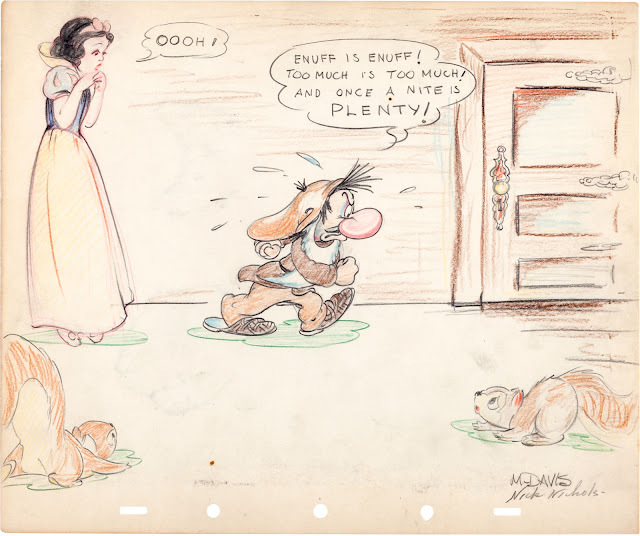 Gag drawing by Disney art director Hugh Hennesy. Animator Joe Magro goes nose to nose with the Old Hag. Mixed media. 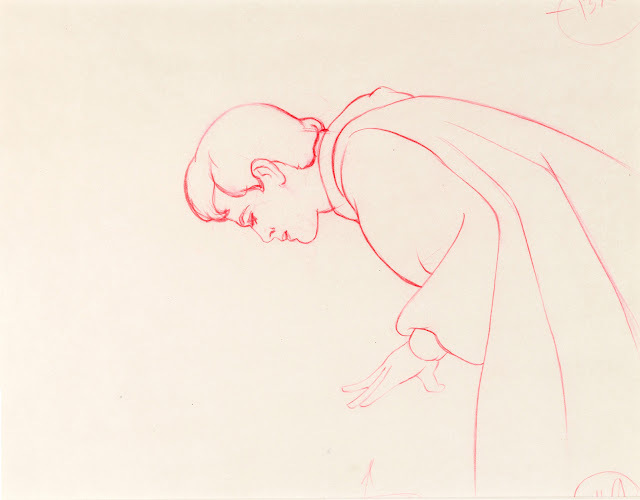 Since Joe was at the Studio during the height of the Snow White production, the majority of drawings within the “good luck” book included some kind of reference to the film. All the pieces were created on 12-field 5-peghole sheets of animation paper (12" x 10"). Gag drawing by Marc Davis. 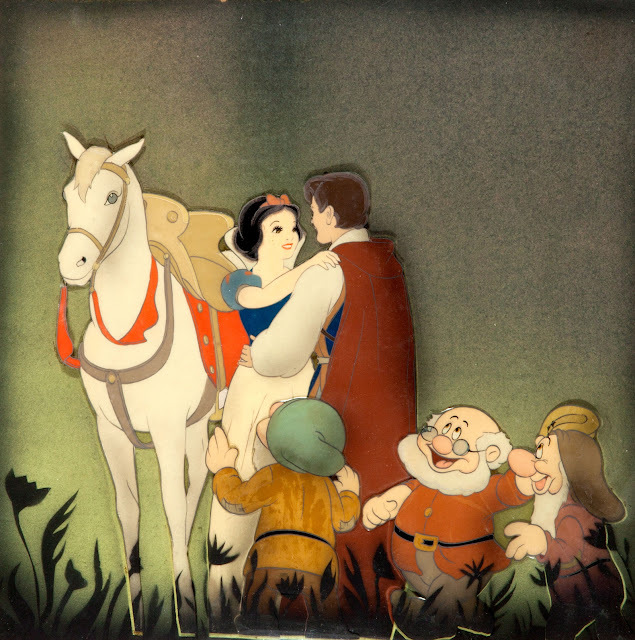 Snow White thinks Joe is "chicken". Mixed media. Gag drawing by Vladimir "Bill" Tytla. 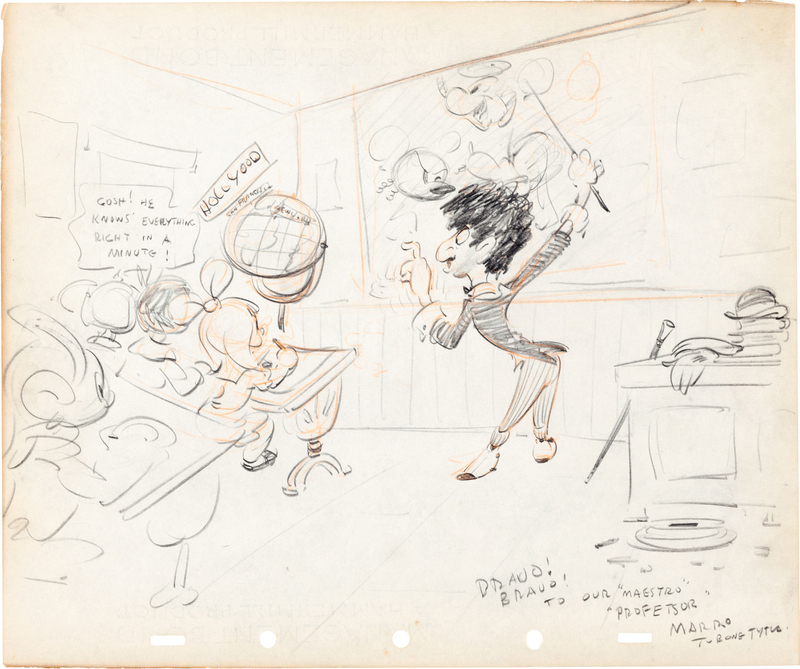 Note Mickey Mouse on the blackboard and Dopey as one of the students. Graphite and colored pencil. Gag drawing by animator Dave Rose. 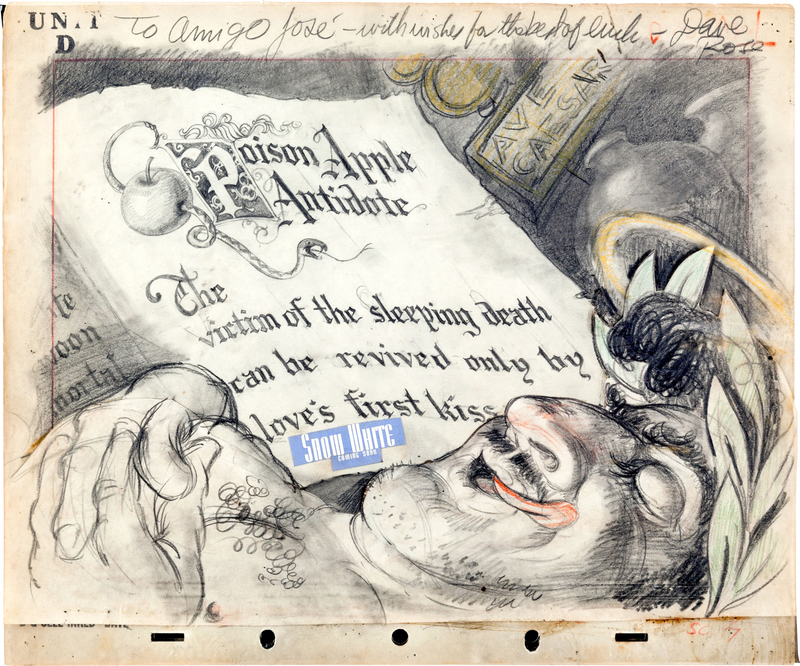 Original layout drawing of the poison apple antidote has been collaged with another piece of art. Graphite and colored pencil. Gag drawing by Grim Natwick. 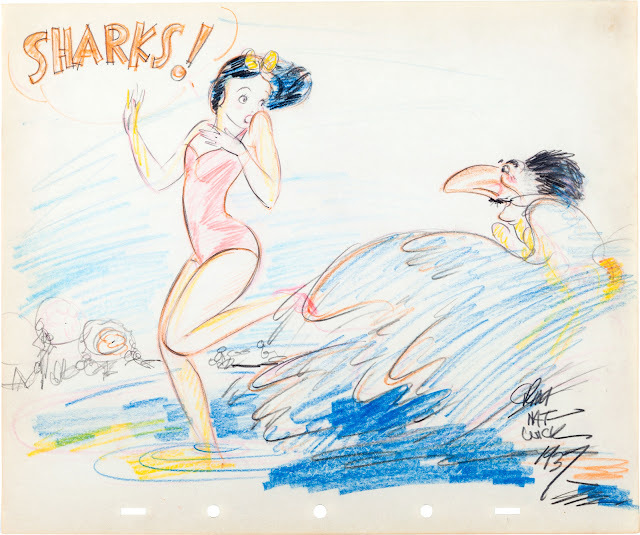 The fairest on the beach meets animator Joe Magro. Rendered in colored pencil. Gag drawing by Fred Moore. Snow's red bow in hair. Tongue-in-cheek caption reads: "But -- what could you possibly do with me in New York?" Mixed media. 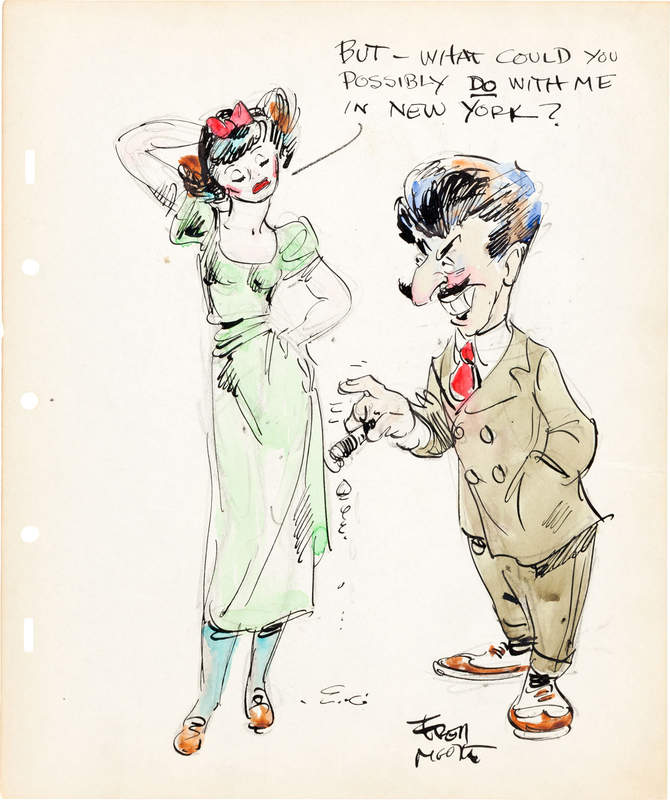 Gag drawing by animator, Jack Larsen. Joe Magro in the lap of luxury. Colored pencil. 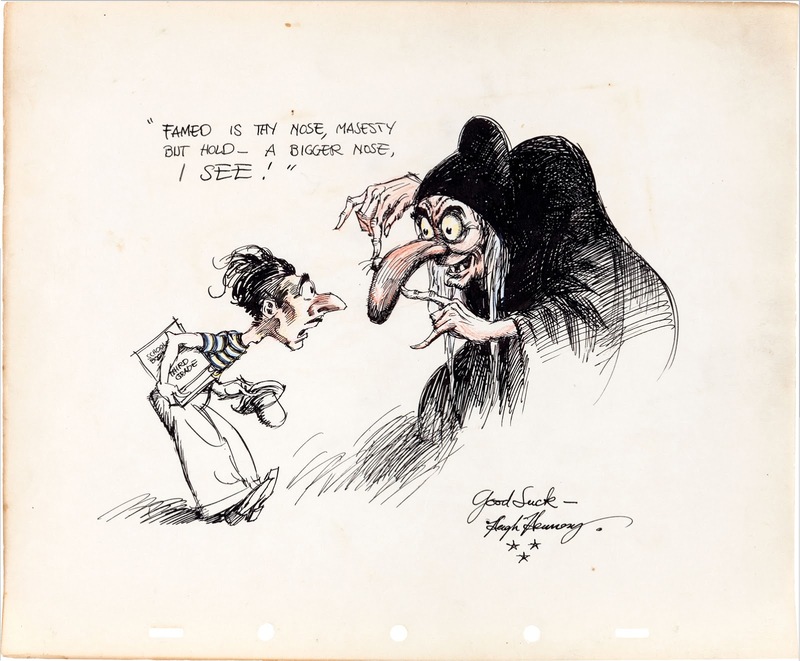 Gag drawing by Marc Davis and Charles "Nick" Nichols. Another humorously cheeky piece. Mixed media. Gag drawing by Charles "Nick" Nichols. Grumpy says goodbye. Graphite and colored pencil. 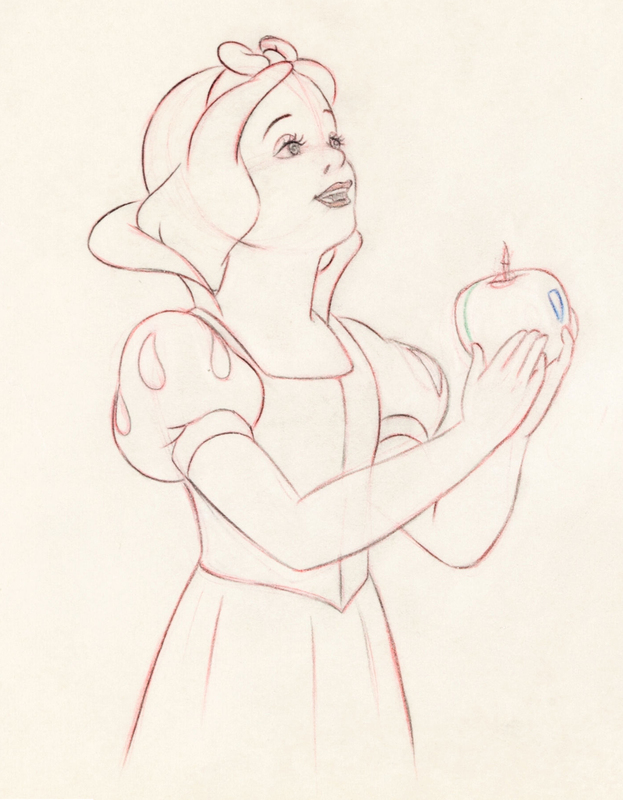 The rest of the (non-Snow White) drawings can be seen at Cartoon Brew. 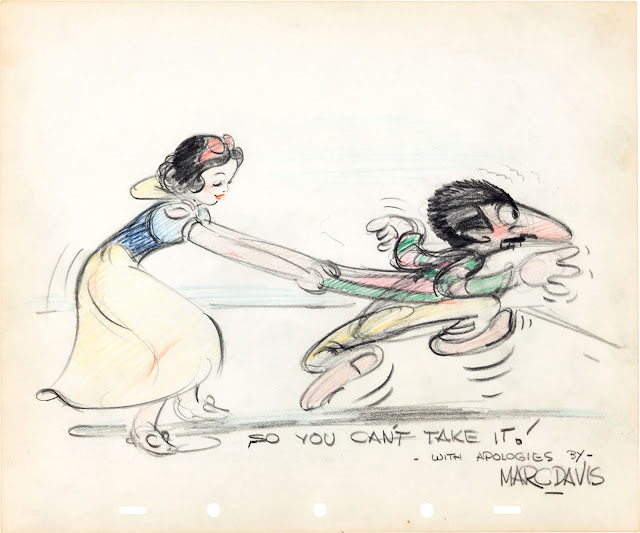 Learn more about Heritage's Animation Art Signature Auction in the previous archive entry. 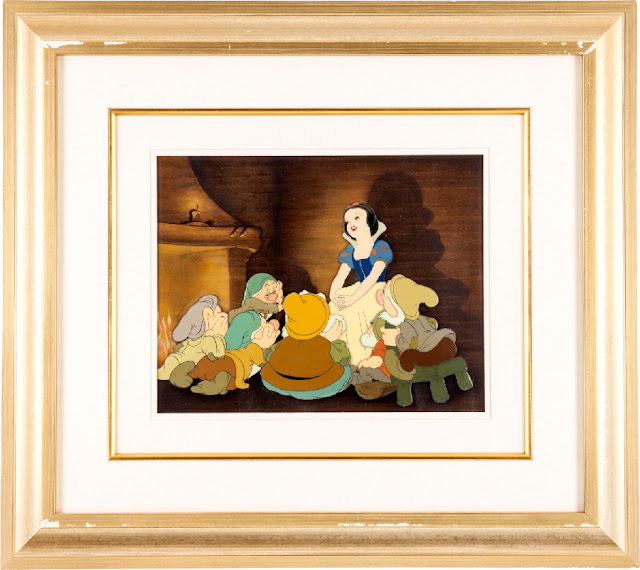 Heritage Auctions is holding their Animation Art Signature Auction in New York City on February 21 and 23 at the Ukrainian Institute of America (Fletcher-Sinclair Mansion). Production Cel on hand-painted, airbrushed gradated Courvoisier background, 1937. 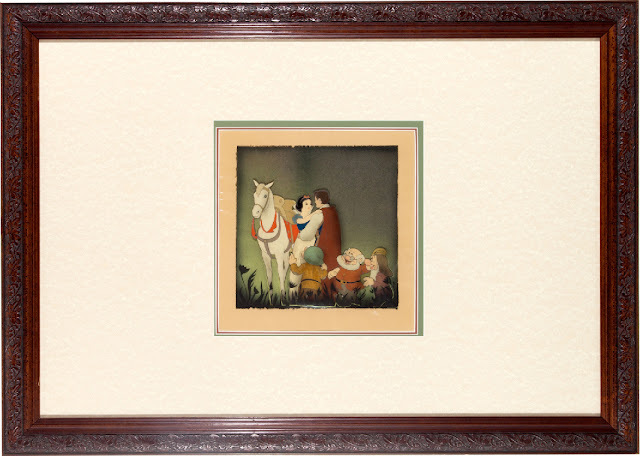 Prince about to lift Snow White on horseback. Image area approximately 8.75" x 8.45". Framed overall size 34" x 24.25". Production Cel in original Courvoisier wood veneer set-up. Snow sings to six of the seven. Hand-painted background effects, 1937. Image area 14.25" x 11.25". 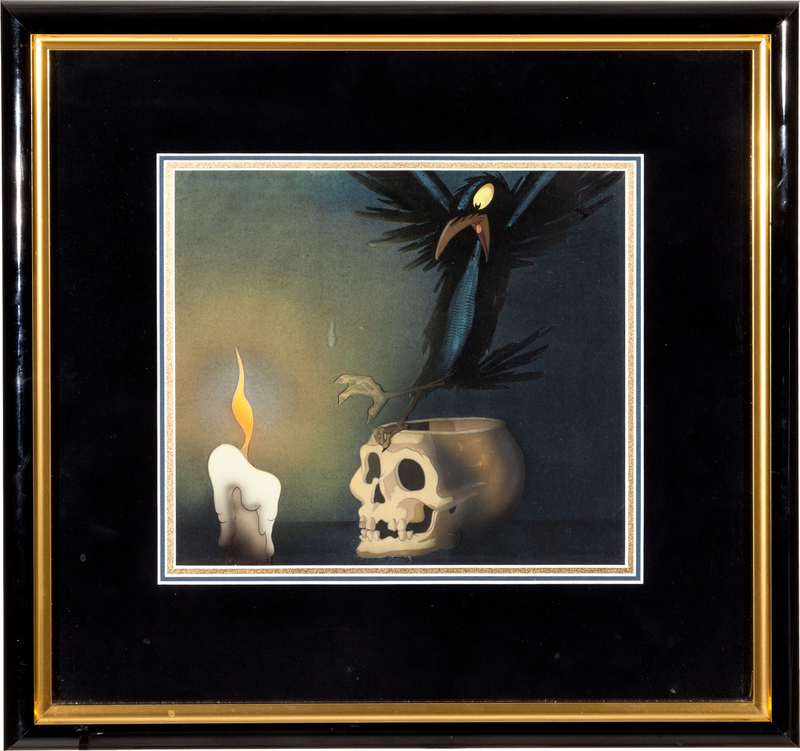 Framed 28" x 25.5". 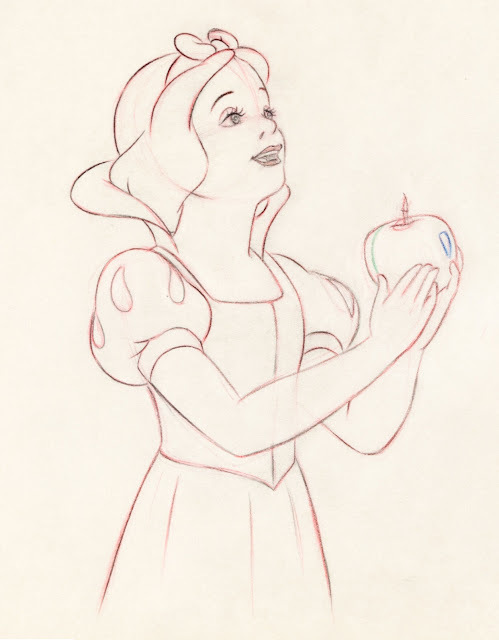 Snow White with Apple Production Drawing, 1937. Red pencil on animation paper with "39" written in the lower right corner. Image area approximately 6". 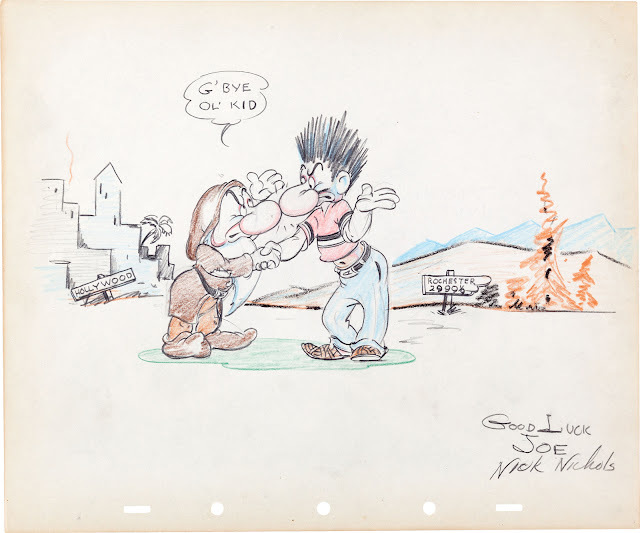 Prince Production Drawing, 1937. 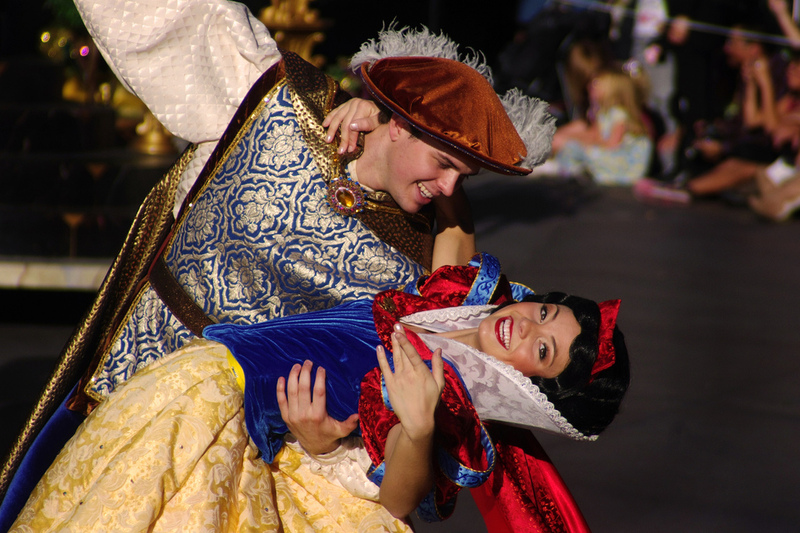 He leans over to kiss Snow White. Rendered in graphite and red pencil on a 12-field sheet of animation paper, 12" x 10". Includes color notations for the cel inkers. 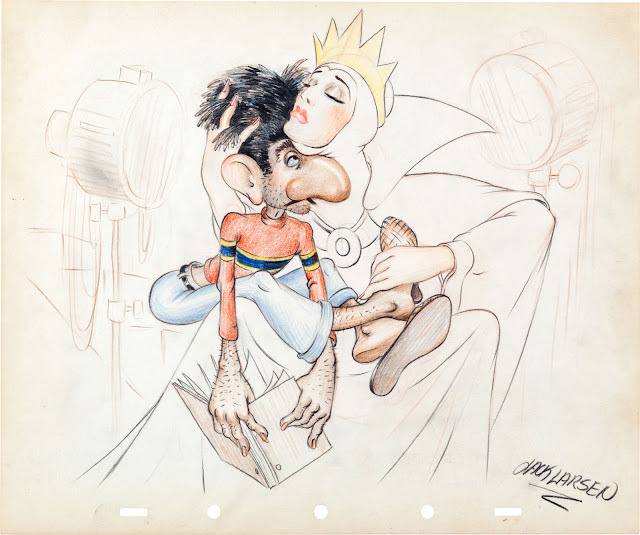 Alex Ignatiev Dopey Publicity Drawing, 1960s. On 16-field animation paper, created for publicity purposes. Image area approximately 5.5" x 4". Old Hag Production Drawing, 1937. Graphite pencil with slight red and green highlights. Images and info via Heritage Auctions. Biancaneve ei Sette Nani - Italian "Adhesives"